Car parks and parking structures have been a source of inspiration for filmmakers, photographers and writers. Yet to the people who use them, they’re not much more than a functional area one would rather leave as quickly as possible. Associations are often negative: too cold, too dark, too stinky and too insecure. Grote Markt (part of a tramtunnel by OMA); a double height area with a length of approximately 2 km. Lutherse Burgwal; a standard parking tower with many levels (split level concept). car is safer then on the streets..
camera surveillance not visible (important for the feeling of safety for the person and over its car). high prices and not paying per minute . We found similar results in our research as in scientific articles on parking garages, most importantly: adequate lighting  and visible opportunities for users to escape from the parking garage. Because adequate lighting and prospect (i.e., visibility into an environment that provides few hiding places for potential offenders) decrease the perception of danger in urban public spaces, especially in spaces where low opportunity for escape cannot be altered (e.g., bridges and parking garages). One of the interesting findings in our small user experience research is that people prefer parking garages with only a few levels instead of the often built parking towers. Even a very long parking garage is preferred over a small parking garage with more levels. As the ones we’ve visited, car parks don’t usually tickle our imagination and people think of them as functional elements only. Innovative planners and creative designers have come up with new and refreshing ways of approaching car park design. In HongKong plans are being made for a modern parking tower which houses space for concerts, fashion shows, art exhibitions and film projections. A fun example of wayfinding is the parking garage of the Hotel Puerta America in Madrid. Parking areas like these are not just about user-experience on a basic level (fulfilling needs like safety, recognisability, accessibility and cleanness), their aim lies on a higher level of being an experience on their own. It is important to focus on the needs and wishes of the users of certain parking garages. For example people who go out glamorously dressed to a theater prefer to park their car in a similarly glamorous environment instead of a grey concrete cold parking garage. This means that a parking space should become a favorite place to be, an fascinating environment which allows you to forget your daily troubles. 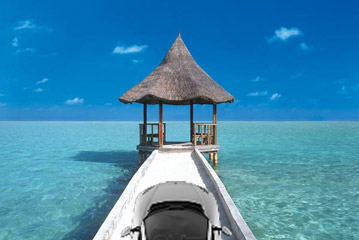 Imagine you can park your car at hut 12 on the Maldives, or on a place with a wonderful view into a garden, or a place with a movie projected on the wall in front of you, or even into a cloud. Parking areas should always aim to answer to the basic requirements of their users. At the same time they have enormous potential to influence our daily experience. Not as dark areas of criminal intent, but a positive surrounding people talk about and want to spent some time. If you have something to add from your own experience with parking garages, just drop us a line on Twitter . C. Tseng, J. Duane, and F. Hadipriono; (2004) Performance of Campus Parking Garages in Preventing Crime; Journal of Performance of Constructed Facilities Volume 18 Issue 1. K. Korpela and T. Hartig; (1996) Restorative Qualities of Favorite Places; Journal of Environmental Psychology Volume 16 Issue 3. This entry was posted in Research by paulwdevries. Bookmark the permalink.